After nearly two months of waiting as the President-elect, Juan Carlos Varela was sworn in this week as the latest President of the Republic of Panama. Varela, who represents the center right (though many would argue he’s more right than center), kicked off his inauguration with a set of fiery speeches in the capital, and later in Colon. Though Panama’s economy is at an all-time high, Varela has an uphill battle to fight, with many serious problems still affecting the Central American nation. Though Panama’s economic growth has averaged double-digit numbers in the past 5 years, there are signs of a slight slowdown. 2013, and the first half of 2014 have seen numbers dip a bit, but the country is still on track for significant positive growth. He is also inheriting the country on the eve of the completion of a major expansion project of the Panama Canal, as well as a recently built subway system, and an enhanced urban infrastructure in the capital. 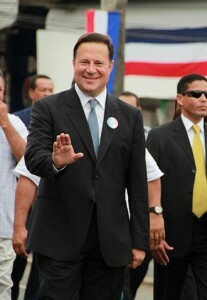 As far as Varela’s concerned, the people expect him to continue the civic and social progress started by his predecessor, while at the same time weeding out some of the corruption, and nepotism, which tarnished the Martinelli regime. This will not be an easy task, as he has many detractors in congress, as well as a slew of powerful political enemies in other parts of local government. He has whole-heartedly vowed to stamp out corruption in government, and expose other corrupt leaders from the region, in order to set a precedent of transparency, and honesty. During his inaugural speech, he said, “From today, no one in Panama is above the law…Corruption will not be tolerated in our government.” Only time will tell if he will actually follow through. President Juan Carlos Varela is already planning the roll-out of a price freeze program on 22 basic food items throughout the country, which should be ready to go within the next few months. His goal is to reduce inflation, as well as the basic cost of living, by regulating food suppliers, as well as paying more attention to workers’ rights, and enforce tougher labor laws on local employers. Again, only time will tell if he will stick with these promises, or that he will be tough on those who do not comply. One of the biggest issues President Varela is inheriting is an increasing crime rate across the country, and a sense of insecurity amongst many Panamanians. With Panama’s economic growth has come a greater scale of inequality, especially in the interior, and other cities outside of the capital. And as expected, Varela is taking a hardline approach to making the country safer. His first initiative is a bold plan to stamp out gangs and drug violence. His somewhat controversial plan is to give around 200 recognized criminal gangs 1 month to disband, and join public life, without reciprocity. After the month is over, he promised to go after those who continue, and with tough consequences. This has been an important issue to the people of Panama, as Panama represents the front line for South/Central American drug trafficking, due to its location and geography. Varela is also looking to reduce the wealth gap, which is a delicate issue, but an important one in a country where nearly half the population lives in poverty. His administration has plans for providing better social welfare programs, new schools, health centers, and job placement facilities. He also plans on improving education by offering more comprehensive, government-sponsored programs to teach English, starting during primary school. While English classes are available to most public school children, his administration plans on a major overhaul, increasing the number of teachers, classes, and improving their curriculum. Despite all of the growth and economic success of the past few years, outgoing President Ricardo Martinelli’s administration left a bad taste in many a Panamanian’s mouth. Varela hopes to change that. He has the tools to so, and wants the country too turn the page on the past, and look forward to a bright future. His path won’t be easy, but as the people showed in the polls this past May, Panamanians have faith that he is the right man for the job. To read more about President Varela, his past, and what he brings to the table as president, check out our blog post on What We Can Expect From Panama’s New President.